Subject: Antique print, titled: 'De schamele woning.' - This print shows the humble home. A man in tattered clothes stands in the middle of a paltry room. Prints are pinned to the wall. Condition: Very good, given age. Some small stains in print. General age-related toning and/or occasional minor defects from handling. Please study scan carefully. Medium: Lithograph on chine collee on wove paper. Size (in cm): The overall size is ca. 11.3 x 17.4 cm. The image size is ca. 9.7 x 16.2 cm. Size (in inch): The overall size is ca. 4.4 x 6.9 inch. The image size is ca. 3.8 x 6.4 inch. 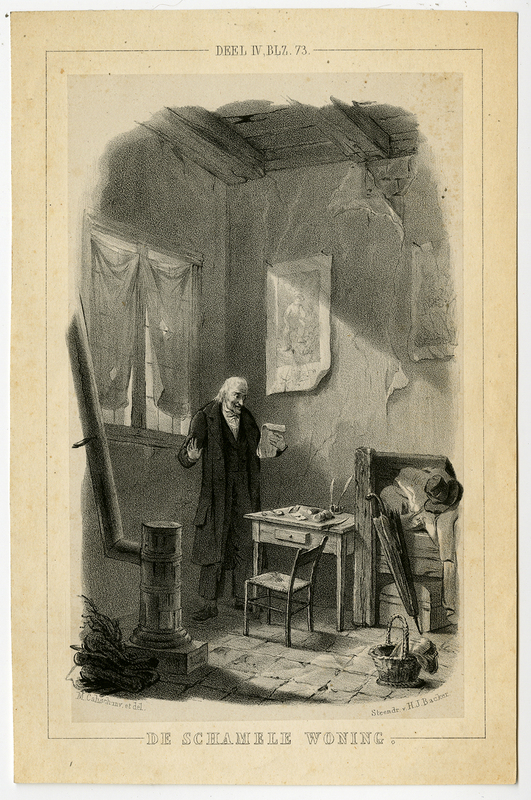 Artists and Engravers: Made by 'M. Cahsch' after 'Hillmar Johannes Backer'. Printed by Desguerrois & Co and Hilmar Johannes Backer.